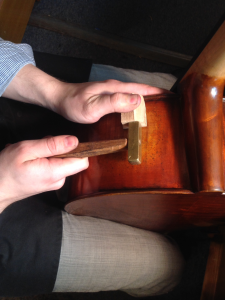 Removing the top of an instrument is usually essential when work is needed on the inside. 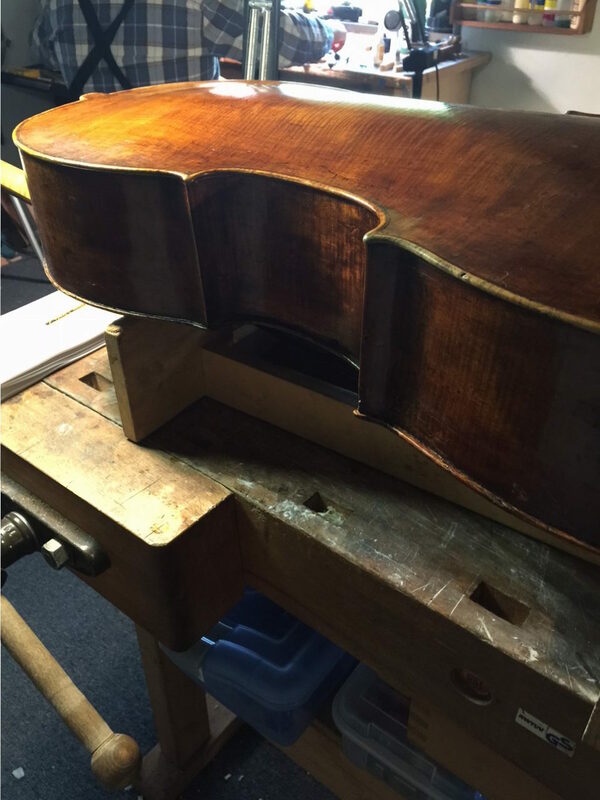 If an instrument requires that the top be taken off, it doesn’t mean the damage is more severe, just that the work will benefit from a proper patch or fit reinforcement. 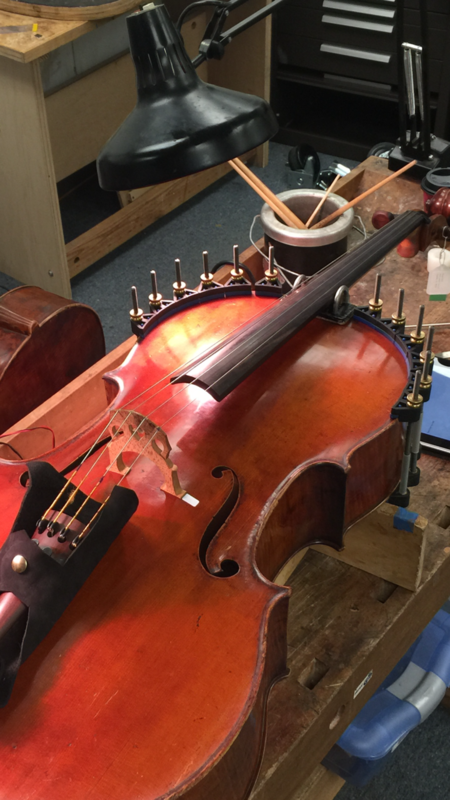 Before we start any work, every instrument and bow at Triangle Strings gets completely evaluated and the original measurements are recorded. 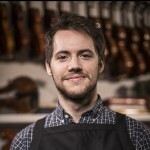 Each of our clients has their own virtual folder where we archive work orders, measurements, and pictures of their instruments and bows. These measurements are necessary so that when we are finished with any work, we can refer back to them so playability doesn’t change. Every work order includes a template on the bottom that prompts for the measurements which we will record. The first column has letters coordinating with the French word for Overstand, Projection, Neck Length and Stop Length listed below. 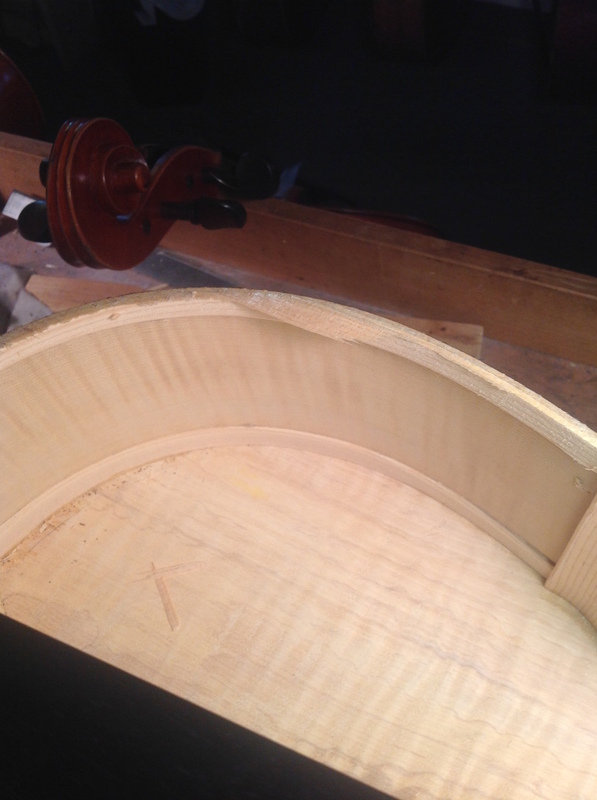 The Appui is the distance from the top of the edge, to the bottom of the fingerboard. This is measured with a straight edge placed on edge length wise on the center of the fingerboard and projecting to the bridge. The recorded number is measured from the top to this projecting ruler. 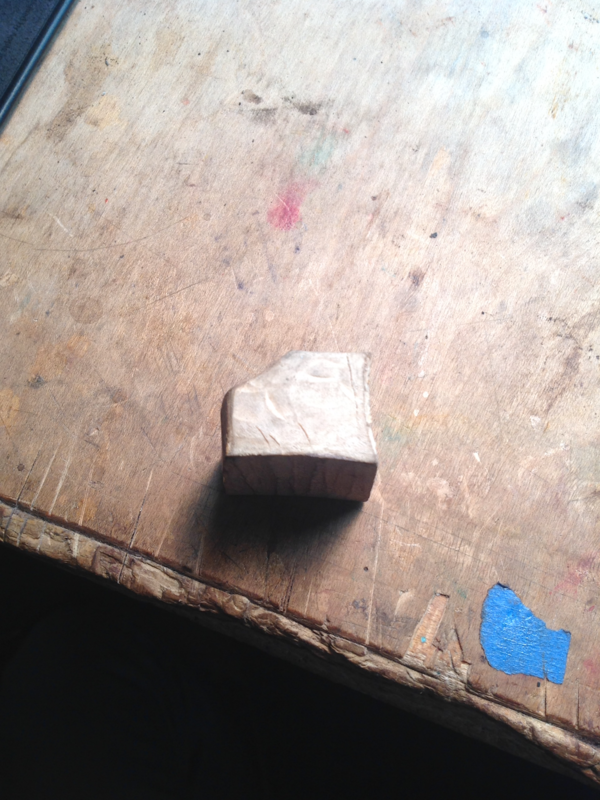 The stop is measured from the top at the treble side edge, to the center of the treble bridge foot. Before starting I suggest completely cleaning your bench, the floor around your bench, and making sure you’re wearing a relatively clean apron. If you are working in your lap, your apron will catch pieces that may fall. Once we have the measurements recorded, the bridge is marked with a layout sticker (if it doesn’t interfere with the repair), the post position is marked with a pencil mark, and the set up is taken down including the post. I’ll use a variety of opening knives for removing a top. First I go around the instrument lightly with my thin knife and check the seams. If there are openings I’ll usually start there. 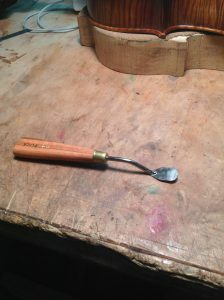 Another way you can open up a seam is with a seam knocker. 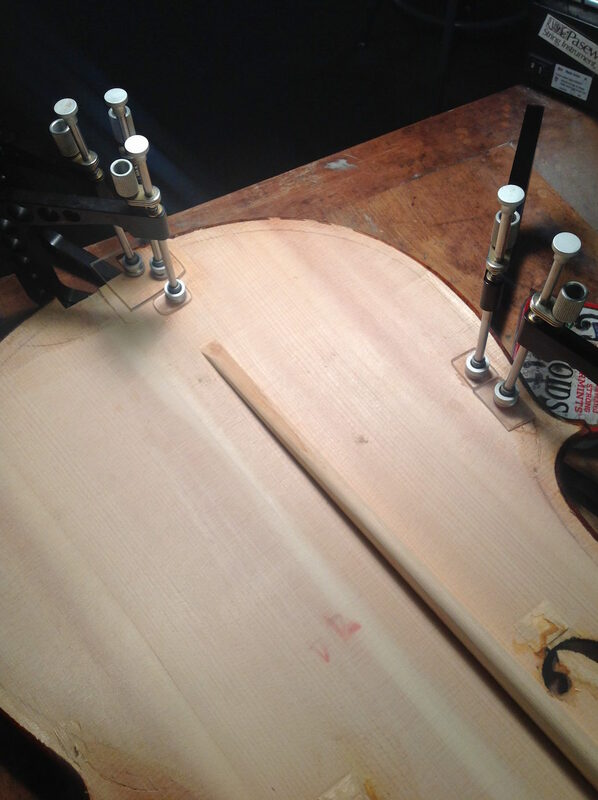 The seam knocker has a few faces that accommodate the curve of a violin or viola rib, and a cello rib, and is made from the softest spruce you can find in order to not dent the top edge. I maneuver the knocker so that I can have my hand supporting the outside of the plate with my thumb securing the knocker. I use my lightest brass hammer for this step. It’s important that you use the knocker only on the end-grain edge of the instrument where there are no replacements and where the edge is stronger. You should also make sure that the edge isn’t damaged with cracks or has had any replaced, otherwise you run the risk of breaking off the replaced edge or extending a crack. There should also be ample edge overhang (distance from the rib to the edge); I might not use the edge knocker if the edge margin is too small from wear. Once you have popped a seam, or found an one open, soap up your opening knife and get it wedged between the plate and the ribs. 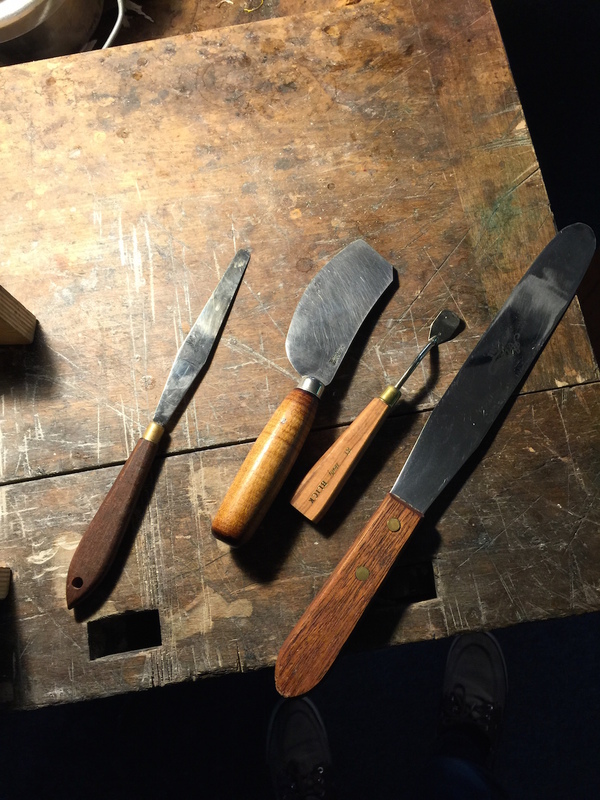 Having opening knives rust free is essential, so we use dehydrated soap (stored in a heated drying cabinet). An important aspect of removing a plate is the ‘feel’ of it popping free from the rib structure. I always support the plate with my non-dominant hand by holding the instrument where my knife is, and slightly ahead of it in the direction I’m opening. If something isn’t feeling natural I’ll stop and make sure I’m not going into the plate. The plate shouldn’t be flexing much, if I feel my knife flexing the plate I will investigate, and be extra cautious. It is also important to be listening to the popping of the glue, if it sounds more like a crack I will stop and check it. In the event that your opening knife starts to go into the top (most commonly happens at the widest part of the bouts), you do not want to try to get back on track from the same direction, but from the other side. 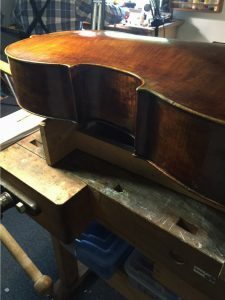 Sometimes, if a saddle is wider than standard, and has more surface glued to the lower block, then it may be harder to remove. Leaving the saddle on the rib structure isn’t a bad idea since it can help you with placement when gluing the plate back on. If opting to remove it, put your knife in at the lower block and if the saddle is being tough, maneuver around it and come in from the other side. You can also check where your knife is by using an inspection light and mirror through the f-hole and checking your progress. I have a few options for relieving the plate from the side of the neck. A single edges razor works well most of the time, however, watch out for the spine of the razor which can scratch the heel and require retouch. I have a cut and shaped palate knife that I sometimes use for this purpose, the blade being shaped down from the handle making for easier access. Once I have the edge of the top plate relieved from the neck, I’ll finish opening everything except the glue joint between the upper block and the plate. Finally, I will come in with the larger knife and remove the plate from the neck block. Getting the plate off the top block can be the trickiest part of the plate removal. Which is why I usually prefer to do it at the end. Often I use an inspection light in the body and look through the end button hole to check progress. If the plate is not coming away from the block, I will use a tiny bit of alcohol by dipping a clean touchup brush in and brushing it onto the inserted opening knife; allowing the alcohol to capillary into the joint. Using alcohol liberally is not advised. If you use alcohol and it is not giving from the block, leave it alone for a while to allow the alcohol to dehydrate the glue and try again. Now that the top is off, check if any spruce pieces have split off from the top in the body of the instrument and place them in a small zip-lock bag so you do not lose any. Then carefully take off any large pieces that are attached to the ribs with an opening knife. I will take off a piece, immediately find where it belongs on the inside of the top, and glue it. For gluing the pieces back on the top plate, we use Alberti clamps with added rubber pieces to protect the varnish side of the plate, and use small soaped pieces of plastic to hold down the pieces being glued to the plate. These Alberti clamps work better than other clamps because the easily adjustable clamp side doesn’t spin when applying pressure. 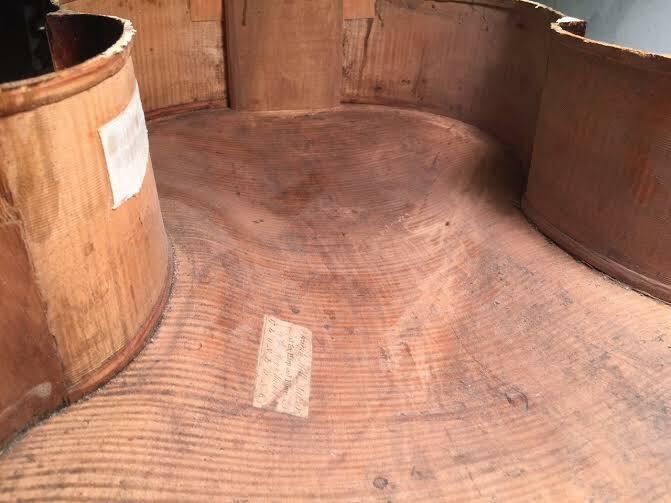 Once we have all the pieces glued back to their original locations, we use a reversible wood filler to fill any small crevasses and proceed with the required repair work. Once we know all necessary work is done, we check the top plate carefully for buzzes. 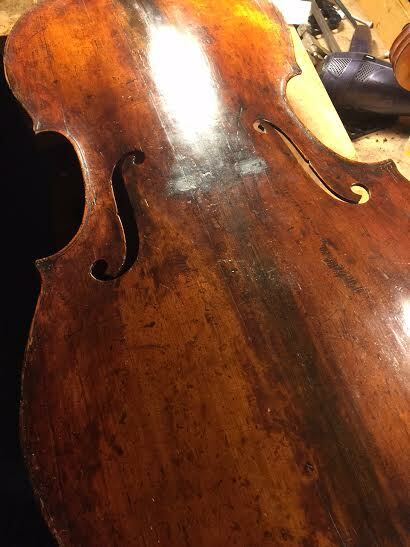 Open cracks, loose cleats, varnish, or glue will buzz; best for you to find them now than the customer finding them at pick-up. Tap tones work well for this. 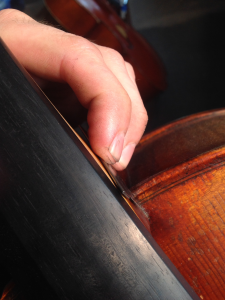 After loosening the strings, It is time to glue the remaining bouts. With the Instrument facing up to check string heights, I will put glue in, and clamp the neck block area using a neck block clamp that ensures full clamping contact between the top block and the plate. 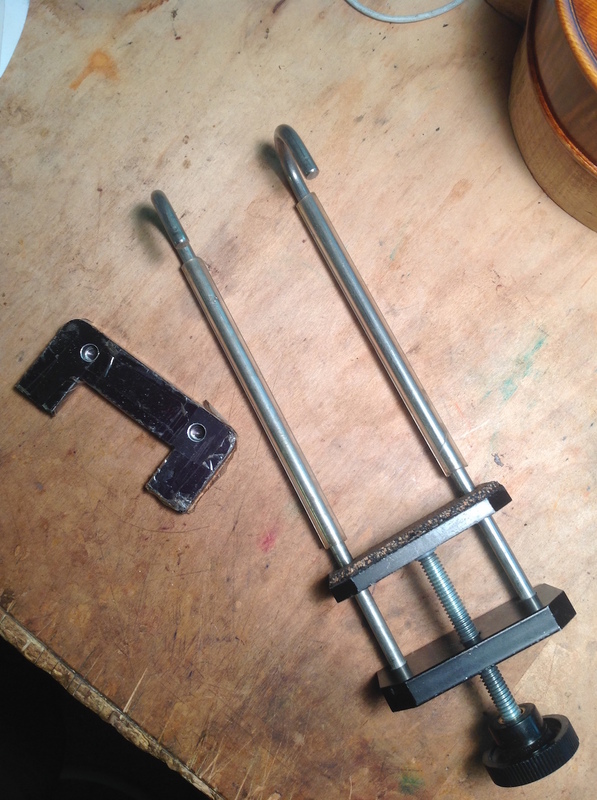 The clamp has a portion that fits under the fingerboard and around the neck. Then I will finally glue and clamp the upper bouts as before, and with full tension check the string heights one last time.slightly tight, I will check the string heights once again. Note the tailpiece protector; when you’re gluing you want all four of the strings attached to the tailpiece so all you will have to do is put the bridge up and slowly bring the strings it up to tension. The tailpiece protector prevents the underside of the tailpiece from contacting and damaging the top. Once the top is glued on, It is time to do all the necessary retouch to the underside of edge where varnish may have chipped off. If it looks like you’re the first to have removed the top, you can expect to spend more time doing the necessary retouch. Nussbaum, ground walnut crystals cut with water, can be very helpful when trying to match the original. The crystals produce a nice red brown color, which matches the under edge of most instruments very well. It’s also important to seal off the under edge with varnish. This entry was posted in Instrument, Techniques. Bookmark the permalink.